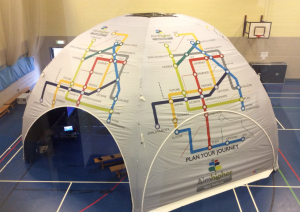 On Friday 5th October, Aimhigher launched the roadshow tour at Sandwell Academy. Year 13 students took part in 90 minute workshops which gave them more information about university life, student finance & myth busting, alternatives to university and pathways to careers. Sessions with year 11, 12 and 13 are available and can last between 30 and 90 minutes depending on what works best for your timetabling. Workshops are designed to accommodate the size of one teaching class at a time (approximately 30 students). All sessions are interactive and will be delivered by skilled Aimhigher staff using tablets and other technology. If you are interested in hosting the roadshow in your school, please do not hesitate to get in touch with Jess Beider at j.beider@bham.ac.uk.